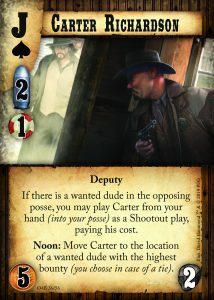 An article from Richard Carter as his Classic character debuts in Reloaded! Great to read design's thoughts, particularly the section on card values as this is a unique element of the game. Thanks for sharing this (the spoiler doesn't hurt either!). The artist imbued Richardson's face with a most delicately specific expression (challenge: can you capture it in 5 words!?). Very well done. Lovely to see a Deputy on Factionless too. Equally useful in "Bounty + Hunt" Lawdogs deck as well as an awesome "clean up hitter" for any deck that plays and defends private deeds. Eager to see our new Lead Designer go Out for Blood! "I'm getting too old for this."